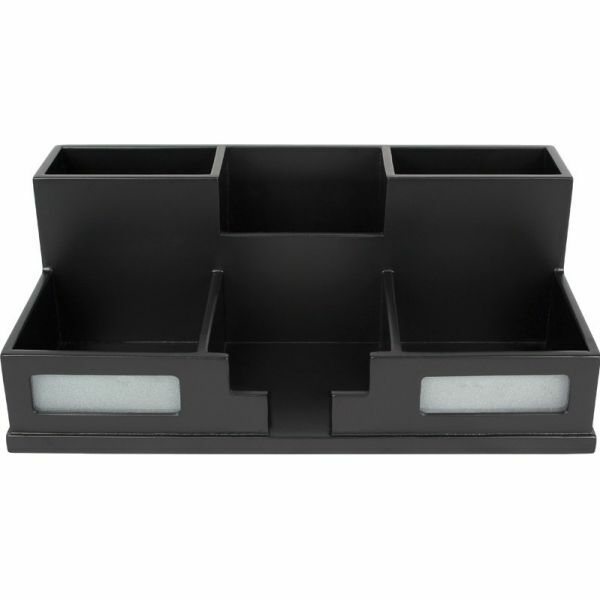 Desk organizer features three small compartments for storing knick-knacks. Three large storage organizer compartments for pens, pencils, and other office supplies. Wood design provides a stylish, practical and elegant desktop organizer. 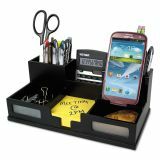 Victor Midnight Black Desk Organizer with Smartphone Holder, 10 1/2 x 5 1/2 x 4, Wood - The Victor Midnight Black Collection brings a fresh perspective to desk accessories by offering functional solutions with appealing design elements. The 9525-5 Desk Organizer with Smart Phone Holder provides compartments for small knickknacks and writing utensils, while providing a removable ergonomic system to hold your mobile device. Features sturdy wood construction with a durable double coated matte black finish. Frosted glass windows add a touch of class. Non-slip rubber feet reduce movement and protect your work surface from scratches and scuffs. Convenient 5.5” x 10.4” x 3.5” design creates multiple ways to keep your desk organized. Perfect for use either at home or in the office. Frosted glass windows and premium, smooth black matte finish.